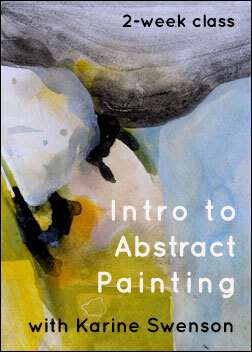 Develop an understanding about how to create an abstract work of art. 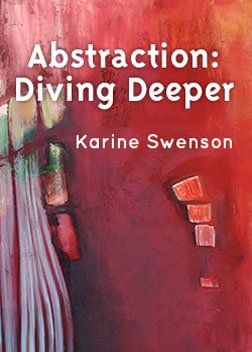 Karine Swenson takes you through three stages of a painting: The beginning, the middle, and the end. Along the way she’ll help you discover your own style and technique that you can bring to your next painting. Have you ever asked yourself, “how do I know when my painting is finished?” In this class, we’ll take a dive deep to find out when your work is really done. The focus of this class is to work through three stages of a painting: The start (“so fun, such excitement!”); the middle (“oh NO! I ruined it!”); and the finish (“Wow! I did it!”). I’ll offer suggestions to help you through each stage as we work towards a resolution. Use whatever paint you want–acrylic, oil or watercolor—for this class it doesn’t matter. (I’ll be using oil, but will offer tips for other kinds of paint as well.) I’ll encourage you to find your own approach to each part of the process. I will not teach specific techniques as much as I will help you discover your own techniques and style. At the end of the class, depending on how quickly you work, you will have finished at least one, if not two, larger sized works If you prefer to work small, that’s OK! However, I encourage you to take on a larger painting. I want you to take risks, and I will help you find ways to “save” a painting if you think you’ve pushed it too far. We’ll spend a lot of time painting in this class, so push up your sleeves and get ready to move around some paint! 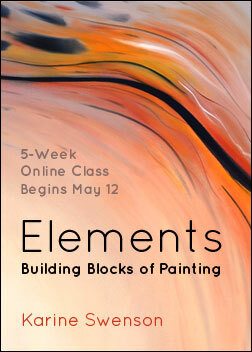 In the first lesson, we’ll explore different approaches to beginning a new painting. I’ll provide suggestions on how to start –you’ll have ots of freedom to find a way that works best for you. If you already have a method you’ve been using, here’s a good chance to try something new. We’llstart a new painting and push it as far as we can in the first lesson. We’ll revisit the painting we started in Lesson 1. Is it finished? Can you push it further? Or have you reached an impasse? We’ll talk about how to look at our own work critically and we’ll push our work even further. You can start a new painting if you need to, but I encourage you to dive deeper into what you’ve started to see what you can learn. Next I’ll send you out to a museum or high-end gallery to look at abstract paintings in person. The idea is to learn from other abstract painters. I’ll give you a list of questions to answer while on your field trip. For those of you who live in rural areas, or who have to schedule this trip, you have the option to do this lesson at any point during the two-week class (Or, if you sign up early and have the time to go before class starts, you have that option too. I can email the questions to you ahead of time). We’ll now re-visit our own painting(s) with the same list of questions we had while looking at other artists’ work. Can we be as objective about our own work? The goal of this lesson is to push deeper into your painting or begin another painting with idea we got while out looking at art on our field trip. The mission isn’t necessarily to copy another artist as much as to discover something new to try in our own work. Sometimes, this can lead to big discoveries! In this final lesson, we’ll look at our work and once again ask “is it finished?” We’ll talk about how this painting leads us to the next, and how we develop the idea of painting as a lifelong practice. We’ll also talk about the practical things we need to do when a painting is finished, such as signing, photographing, framing, wiring the back, and so on. *If you will be using watercolor, then buy good size, 100% rag paper, 140 lb. or greater. 16 x 20 inches or larger. We will be spending time on each piece, so invest some money in your surface. You will be glad you did. *If you will be using acrylic or oil, then buy either stretched canvas (you can stretch your own), or good quality wood panel painting surfaces. At least 16 x 20 inches, if not larger. Primed or you can prime yourself. They need to be ready to accept paint. You may know already how fast you paint (or how slowly). This is a two-week class. 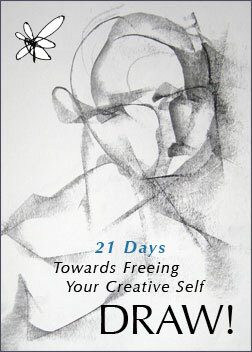 The lessons will be for at least two paintings to be started and worked towards a resolution. If you have been putting off working larger, but want to try it, this is your chance!!! You can even spend the entire two weeks on one painting, if you wish. Watercolor, gouache, acrylic or oil paint. Your choice. I will be working in oil. Make time during the next two weeks to visit an art museum or art gallery. 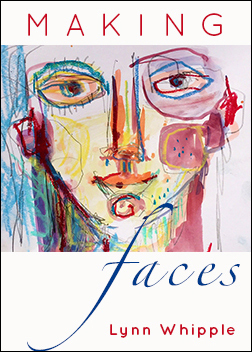 This will be one assignment – to see abstract paintings somewhere IN PERSON. If you live in a rural area, you may have to travel to do this. If this is going to be difficult for you, a book of your favorite abstract painter or an online search for a favorite painter will suffice. However, I do hope that at some point during the next 6 months you make time to see original abstract paintings in person. It is a valuable and worthwhile experience. Karine Swenson grew up just outside of a town called Rapid City, South Dakota in the Black Hills. The closest neighbor was a mile away. 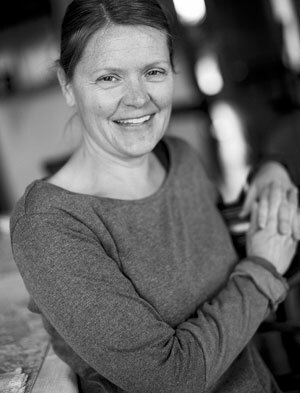 Reared in this environment, Swenson’s connection with the natural world was strong. 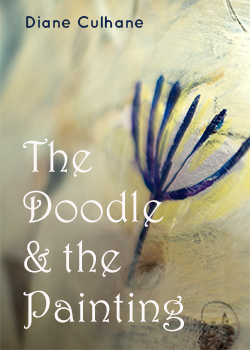 After receiving her BA in painting from Augustana College in Sioux Falls, South Dakota, she moved to Colorado. She has spent most of her life in small towns that sit right next to the last remaining bits of wilderness. From the mountains of Colorado, the ocean surrounding Maui, Hawaii and now the desert near Joshua Tree, California, she feels the most at home out in nature. In the studio, her second home, she can explore her relationship with the natural world. Her oil paintings are reflections of this relationship. Swenson has been a full time artist for the past ten years. See more wonderful art at Karine’s website: www.karineswenson.com.